After a four year hiatus to spend time touring, releasing records, winning awards, making movies, writing books, and undertaking a host of new projects, The Mittentime Revue crew is reuniting to bring P.E.I. the kind of artistic Christmas pageantry that only it can present. Performing for one night only on December 3 at 7:30 p.m. in the Homburg Theatre, the Revue features a who’s who of the East Coast Music scene. Jenn Grant, Rose Cousins, Catherine MacLellan, Tanya Davis, Dan Ledwell, Patrick Ledwell, and Kinley Dowling join forces for a rousing festivity of words and music, laughs and antics, dashing theatrics, and holiday cheer. 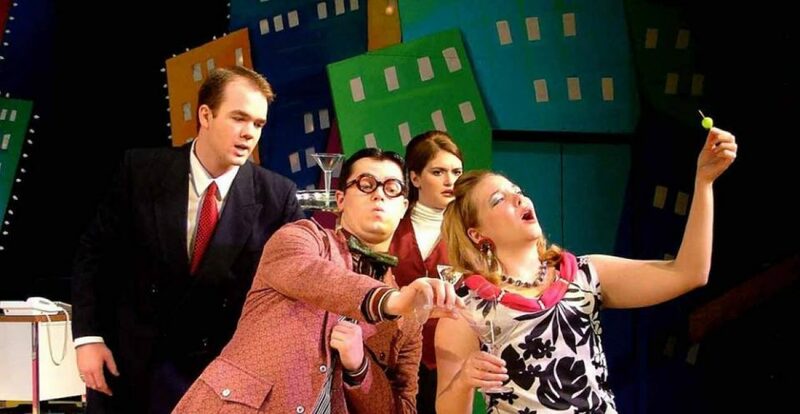 Born out of friendship and a shared love of performing, The Mittentime Revue kicked off in 2007 to a sold-out crowd and instant critical and audience acclaim. A five year run solidified its reputation as a season highlight before the team took a break to follow other creative pursuits. Well, pursuit will bring them together for Christmas, eager to dust off the decorations and present the newest version of their hit show. Join these celebrated Islanders or a gleeful reunion in P.E.I.’s premiere performance hall. Expect creative renditions of your favourite carols, original poems and stories written just for this occasion, and, of course, the best holiday medley yet. Come ready for serenades and escapades, for the humour this dynamic group so easily expresses – charming, candid, infectious. The Mittentime Revue is presented as part of Sobeys LIVE @ the Centre. This one-night only performance is sponsored by Hansen Electric. Tickets for this and other seasonal concerts are available at the box office at (902) 566-1267, toll free at 1-800-565-0278, or online at confederationcentre.com. Appreciation is extended media sponsors The Guardian, Hot 105.5, and Ocean 100. Let the students of the Atlantic Academy of Performing Arts entertain you as they sing, dance and celebrate the Christmas season in the Land of Oz! A snow blizzard carries Dorothy and Toto to the Magical Elfinsland where Glinda is the Good Witch of the North Pole. Dorothy must get home to open her Christmas presents in the morning, so she sets off to meet the Wizard who lives in the Great Palace of Toys. Who will help Dorothy get back to Kansas in time for Christmas? Christmas in Oz is at the Harbourfront Theatre on Saturday, December 3, at 4 PM. Confederation Centre has announced that three plum roles are up for grabs at The 2017 Charlottetown Festival. Incoming director of Anne of Green Gables—The Musical™ Adam Brazier is auditioning for the title role of Anne Shirley and her Avonlea guardians, Matthew and Marilla Cuthbert. For the past two summers, the parts have been held respectively by Islanders Jessica Gallant and Hank Stinson, and Festival veteran, Charlotte Moore. Adam Brazier, the Centre’s artistic director, has completed casting for the musical’s other lead roles and the Anne™ ensemble, some of whom will perform in Million Dollar Quartet. The full company and the 18th actress to don the red braids at the Festival will be revealed in winter 2017. Christmas in Victoria with The Eastern Belles on Sunday, December 11 @ 3pm. Don’t miss out! Only a few seats left. Join us for an afternoon of wonderful song and good cheer guaranteed to put you in the Christmas spirit. This concert is a major fundraiser for the Playhouse and the proceeds will go toward the costs of producing the Victoria Playhouse Festival 2017. Save Big – Buy a 2017 Flex Pass at the 2016 Price! The 2017 Flex Pass is on sale until December 31 at the 2016 price of $100. This price includes tax and service fees! Beginning January 1, 2017 the Pass will cost $110. The Flex Pass is valid for four admissions to any performance of the plays and concerts in the 2017 season. Purchase your Pass now and choose your dates when the season is announced. Take three friends to one show or see four different shows yourself. You save 20% off the regular Adult ticket price!